1.2. What is a planning problem? Every organization faces planning problems: provide products or services with a limited set of constrained resources (employees, assets, time and money). 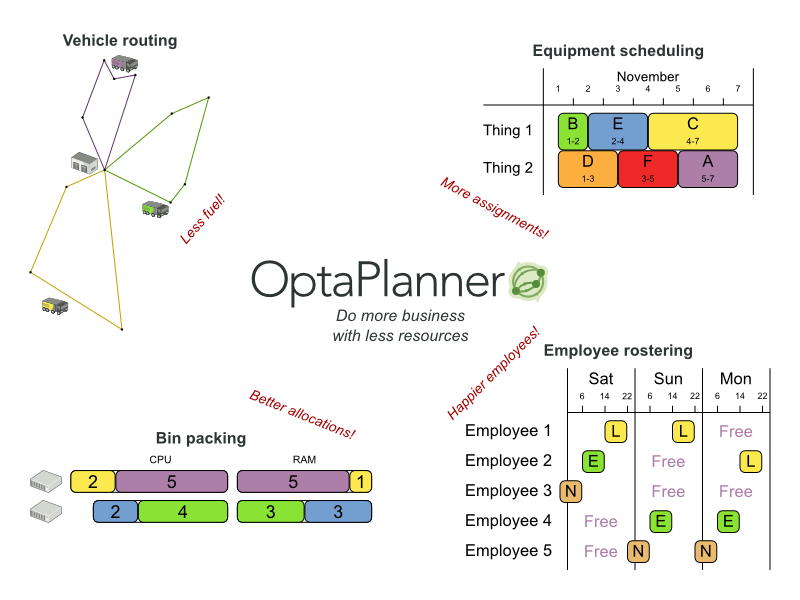 OptaPlanner optimizes such planning to do more business with less resources. This is known as Constraint Satisfaction Programming (which is part of the discipline Operations Research). OptaPlanner helps normal JavaTM programmers solve constraint satisfaction problems efficiently. Under the hood, it combines optimization heuristics and metaheuristics with very efficient score calculation. OptaPlanner is open source software, released under the Apache Software License 2.0. This license is very liberal and allows reuse for commercial purposes. Read the layman's explanation. OptaPlanner is 100% pure JavaTM, runs on any JVM and is available in the Maven Central Repository too. It's easy to verify a given solution to a problem in reasonable time. There is no silver bullet to find the optimal solution of a problem in reasonable time (*). (*) At least, none of the smartest computer scientists in the world have found such a silver bullet yet. But if they find one for 1 NP-complete problem, it will work for every NP-complete problem. In fact, there's a $ 1,000,000 reward for anyone that proves if such a silver bullet actually exists or not. A brute force algorithm (even a smarter variant) will take too long. A quick algorithm, for example in bin packing, putting in the largest items first, will return a solution that is usually far from optimal. By using advanced optimization algorithms, Planner does find a good solution in reasonable time for such planning problems. A (negative) hard constraint must not be broken. For example: 1 teacher can not teach 2 different lessons at the same time. A (negative) soft constraint should not be broken if it can be avoided. For example: Teacher A does not like to teach on Friday afternoon. A positive soft constraint (or reward) should be fulfilled if possible. For example: Teacher B likes to teach on Monday morning. Some basic problems (such as N Queens) only have hard constraints. Some problems have 3 or more levels of constraints, for example hard, medium and soft constraints. These constraints define the score calculation (AKA fitness function) of a planning problem. Each solution of a planning problem can be graded with a score. With Planner, score constraints are written in an Object Orientated language, such as Java code or Drools rules. Such code is easy, flexible and scalable. A possible solution is any solution, whether or not it breaks any number of constraints. Planning problems tend to have an incredibly large number of possible solutions. Many of those solutions are worthless. A feasible solution is a solution that does not break any (negative) hard constraints. The number of feasible solutions tends to be relative to the number of possible solutions. Sometimes there are no feasible solutions. Every feasible solution is a possible solution. An optimal solution is a solution with the highest score. Planning problems tend to have 1 or a few optimal solutions. There is always at least 1 optimal solution, even in the case that there are no feasible solutions and the optimal solution isn't feasible. The best solution found is the solution with the highest score found by an implementation in a given amount of time. The best solution found is likely to be feasible and, given enough time, it's an optimal solution. Counterintuitively, the number of possible solutions is huge (if calculated correctly), even with a small dataset. As you can see in the examples, most instances have a lot more possible solutions than the minimal number of atoms in the known universe (10^80). Because there is no silver bullet to find the optimal solution, any implementation is forced to evaluate at least a subset of all those possible solutions. OptaPlanner supports several optimization algorithms to efficiently wade through that incredibly large number of possible solutions. Depending on the use case, some optimization algorithms perform better than others, but it's impossible to tell in advance. With Planner, it is easy to switch the optimization algorithm, by changing the solver configuration in a few lines of XML or code. 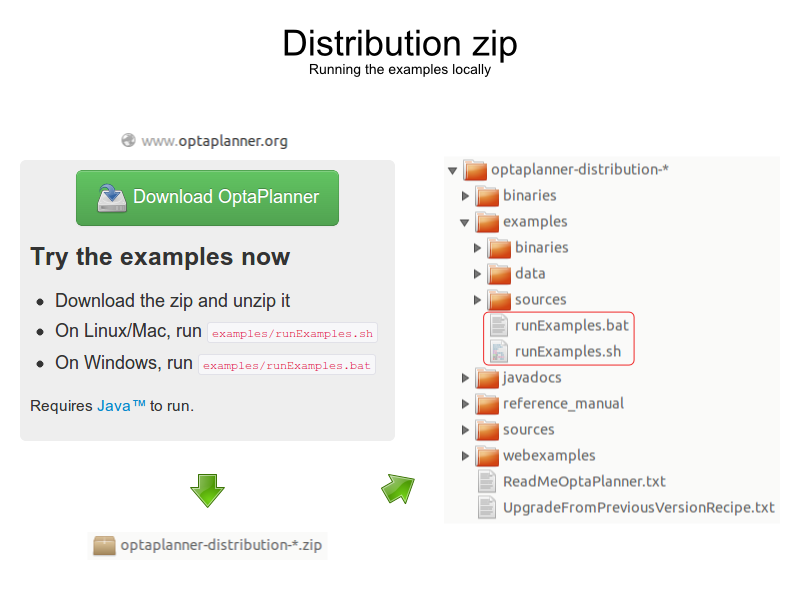 Download a release zip of OptaPlanner from the OptaPlanner website. Open the directory examples and run the script. Planner itself has no GUI dependencies. It runs just as well on a server or a mobile JVM as it does on the desktop. In IntelliJ and NetBeans, just open the file examples/sources/pom.xml as a new project, the maven integration will take care of the rest. In Eclipse, open a new project for the directory examples/sources. Add all the jars to the classpath from the directory binaries and the directory examples/binaries, except for the file examples/binaries/optaplanner-examples-*.jar. Add the Java source directory src/main/java and the Java resources directory src/main/resources. The OptaPlanner jars are also available in the central maven repository (and also in the JBoss maven repository). This is similar for Gradle, Ivy and Buildr. To identify the latest version, check the central maven repository. If you're still using ANT (without Ivy), copy all the jars from the download zip's binaries directory and manually verify that your classpath doesn't contain duplicate jars. The download zip's binaries directory contains far more jars then optaplanner-core actually uses. It also contains the jars used by other modules, such as optaplanner-benchmark. Check the maven repository pom.xml files to determine the minimal dependency set for a specific version of a specific module. You can also easily build OptaPlanner from source yourself. OptaPlanner is production ready. The API is almost stable but backward incompatible changes can occur. With the recipe called UpgradeFromPreviousVersionRecipe.txt you can easily upgrade to a newer version and quickly deal with any backwards incompatible changes. That recipe file is included in every release. 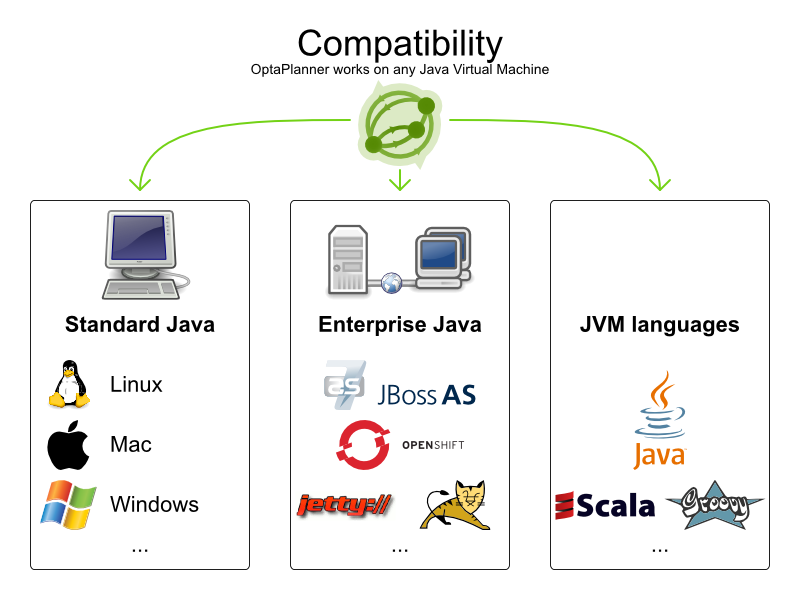 OptaPlanner is 100% pure JavaTM and runs on any JVM 1.6 or higher. Your questions and comments are welcome on the user mailing list. Start the subject of your mail with [planner]. You can read/write to the user mailing list without littering your mailbox through this web forum or this newsgroup. Feel free to report an issue (such as a bug, improvement or a new feature request) for the OptaPlanner code or for this manual to our issue tracker. Pull requests are very welcome and get priority treatment! By open sourcing your improvements, you 'll benefit from our peer review and from our improvements made upon your improvements. Check our blog, Google+ (OptaPlanner, Geoffrey De Smet) and twitter (Geoffrey De Smet) for news and articles. If OptaPlanner helps you solve your problem, don't forget to blog or tweet about it!